Fortunately, true orthodontic emergencies are very rare. However, if one should occur, we make every effort to make sure that you are comfortable as soon as possible. Dr. Steiman's rule of thumb is that if something is hurting in your mouth, it means something is wrong. Orthodontics puts pressure on teeth and bones, but there should not be a “pinching” type of discomfort ever! Should an emergency arise that you can't take care of yourself, then you should call our office as soon as possible. We will schedule an appointment to resolve the problem. True emergencies involving discomfort are always seen the same day. After office hours, Dr. Steiman can be paged for urgent matters only. If Dr.Steiman is away from the office, emergency coverage is arranged for his patients. You may be surprised to learn that you can temporarily solve many of the problems yourself until we are able to properly repair the problem. It is very important that the patient calls our office as soon as possible. Allowing your orthodontic devices to remain damaged for an extended period of time may lengthen your treatment time. Please read the “Orthodontic Dictionary” section of our website to learn the names of the devices in your mouth so that you can properly describe the problem to our staff when calling our office to schedule an emergency visit. Poking Wire: Small, soft ligature wires are sometimes used in place of a coloured elastic donut in order to tie the wire into the brace. The end of this wire is tucked in, but can occasionally be pulled up by food or other oral habits. Using the eraser end of a pencil, push the wire end down and out of the way. You can also place some soft wax over the small end. In some cases, the arch wire can rotate out the back of the brace or band on the very back molar tooth. Place some of our soft wax over this extended end to relieve any discomfort and call our office for an emergency appointment. We can realign your wire properly and quickly. Loose Bracket (Brace) or Band: If your brace or band is still attached to the wire, you should just leave it in place. Place some soft wax on the brace/band to hold it in place. Don't worry; you won't swallow it. If the brace/band comes off the wire, please save it. We can reattach it at your next visit. Loose Wire: Some orthodontic arch wires are quite soft and food may occasionally pull them out of the last brace/band on the very last molar tooth. This loose end can be reinserted into the brace/band using tweezers or fingers. If you can't get the wire back into the brace/band, place a small amount of wax over the wire end to secure it up against the brace/band until we can reinsert it properly. If this still doesn't help, use a nail clipper to cut the wire behind the last tooth which has a tie on it. Make sure you remove the small cut piece out of your mouth. Removable device does not fit properly and causes discomfort: Leave the device out of your mouth and call our office. Dr. Steiman and his staff will adjust it properly so that it fits comfortably again. Headgear does not fit properly and causes discomfort: If headgear is not worn as instructed, or is not brought to appointments to be adjusted regularly, it can become difficult to put on and cause molar discomfort during wear. In either case, leave the headgear off and call our office so that we can examine the headgear fit and force level and adjust it so that it is comfortable once more. 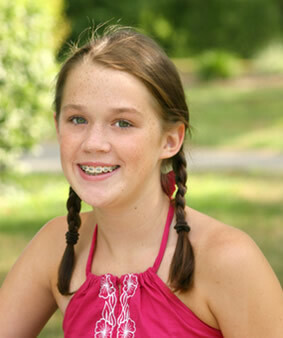 After the arch wires are inserted into your braces and your teeth begin to move, they will most likely become sore. This is very common and happens to almost everybody. This soreness will last about two to four days. The best way to relieve this discomfort is to eat soft foods and take a pain reliever, such as Advil or Tylenol. Discomfort can also be relieved by rinsing your mouth with warm saltwater.